I know I should eat breakfast, but I rarely do. Can you explain why it’s so important? I’m always looking for ways to try to lose some extra pounds, and it seems like a good idea to not eat when I’m not hungry, which is typically in the morning. On the surface, your habits make some sense. Nutritionists regularly encourage people to become more attuned to their inner hunger and appetite signals, and not eating (or stopping eating) when your hunger is satisfied is doing just that. But this raises the question: Why aren’t you hungry in the morning? The whole reason the meal is called “breakfast” is because by eating it, you’re breaking the fast you’ve experienced overnight. Do you typically eat a heavy dinner or have a high-calorie snack at night? Cutting back later in the day might be more effective at helping you lose those extra pounds than skipping breakfast. A new study sheds some light on why this might be. The British study, recently presented at the Neuroscience 2012 conference, focused on the differences in people’s brain activity when they skip breakfast and how that affects their calorie intake later in the day. For the study, researchers asked participants to come in for two MRIs (magnetic resonance images, or brain scans) before they had anything to eat that day. On one of their visits, they were given breakfast before the MRI; on the other visit, they weren’t. All were given lunch after the tests. The researchers found that when the fasting participants were shown pictures of high-calorie foods during the MRIs, the pleasure-seeking portion of the brain was activated more strongly than when they had eaten breakfast. The breakfast-skippers also ate more at lunch. This finding supports other research that shows that eating breakfast can reduce overall food intake for the rest of the day. In fact, an expert panel at the Institute of Food Technologists conference earlier this year reported that studies of young people show that those who don’t eat breakfast consume 40 percent more sweets, 55 percent more soft drinks, 45 percent fewer vegetables and 30 percent less fruit than those who do. Breakfasts higher in protein, including yogurt, an egg (including egg in waffles or French toast) or even hummus, for example, seem to have a stronger effect. So, see if you can change your morning routine to incorporate a breakfast that includes some protein. It just might make a difference in helping you lose those extra pounds. A group of us were watching a football game last week, and someone claimed that the tortilla chips we were eating counted as a “whole-grain” food. I find that hard to believe. Is that right? It could be. To determine whether a food is “whole grain,” take a look at the ingredients on the food label. You’ll find that many types of tortilla chips and other corn-based snack chips list “whole-grain corn” as the primary ingredient. Whole-grain corn, like whole wheat or other whole grains, is indeed, well, a whole grain. While this could mean the chips are a better choice than a snack made entirely of refined grains, don’t take that as permission to down a family-size package. While the U.S. Dietary Guidelines recommend that at least half the grains we eat should be whole grains, most Americans eat a lot more grain-based foods than we need, period — often more than double what’s recommended. So while it’s a good idea to replace the refined grains we eat with whole grains, it’s just as important to remember to keep total grain consumption in check in the first place. And it’s also important to take into consideration other factors that affect the overall healthfulness of a food: the amount of saturated fat, sodium and added sugars, for example, as well as the number of calories per serving. Whole grains are preferred over refined grains for a simple reason: Calorie for calorie, they offer more nutrition. Whole grains include the entire grain kernel, which provides nutrients including iron, magnesium, selenium, B vitamins and often dietary fiber. Refined grains, on the other hand, have been milled to remove the bran and germ from the grain — this increases their shelf-life and gives the grain a finer texture, but also strips them of most of their nutrients. Most refined grains are enriched with B vitamins and iron to replace some of what was lost in the refining process, but enrichment can’t replace everything. Foods with the primary ingredient listed as a “whole” grain, such as wheat or corn. Whole-wheat bread, or bread that contains a good portion of whole grain indicated by being at or near the top of the ingredients list. Oatmeal, rolled oats or whole oats. Terms such as “multigrain” or “stoneground” do not indicate whether the grain is whole or not. For more tips, see the Choose My Plate web page at http://bit.ly/whlgrns. Sometimes when I open a package of ground beef, the meat has turned grayish brown on the inside. It smells OK, but it doesn’t look very appetizing and I wonder if it’s safe to eat. Is it? Most likely, it’s fine. Ground beef’s bright red color comes from a pigment, myoglobin, which becomes red when exposed to oxygen (turning it into oxymyoglobin). The plastic wrap covering the ground beef you see in the grocery store is permeable, allowing some oxygen to seep through and keep the meat on the exterior red. But ground beef that’s not exposed to oxygen — like the meat that’s on the interior — will often lose its red color after a few days. However, if the ground beef is gray or brown throughout, it could be beginning to spoil. If you do detect an off odor or if the meat seems sticky or slimy, throw it away. Although bacteria that cause spoilage don’t always cause illness, there’s no sense in taking a chance. Bacteria that can cause illness are really of more concern, but unfortunately they don’t announce their presence through changes in appearance or aroma. Salmonella, E. coli O157:H7 (or other types of E. coli that produce Shiga toxin), Campylobacter jejuni, Listeria monocytogenes and Staphylococcus aureus have all been associated with ground beef and can cause severe illness, or even fatalities, especially in vulnerable people including children, the elderly or anyone who lives with a chronic illness. To minimize the chance that these bacteria could multiply and thereby increase the risk they could cause illness, be sure ground beef is stored at 40 degrees F or lower, cooked to an internal temperature of 160 degrees F, and otherwise handled properly. Ground beef should be kept in the refrigerator — in the coldest part — for only one or two days before being cooked. Place it in the freezer for longer-term storage, but even there it can lose quality over time; it’s best to use it within four months. Use freezer paper or freezer-quality plastic bags to help prevent freezer burn — indicated by grayish-brown leathery spots on the surface. That’s caused by air coming into contact with the food. Again, those spots aren’t unsafe, but they’ll be tasteless and chewy; you’ll want to trim them away either before or after cooking. 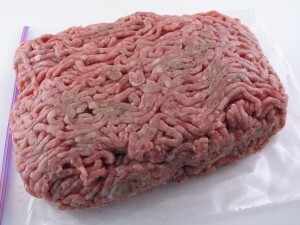 The U.S. Agriculture Department has more information about safety and quality issues related to ground beef on its Food Safety and Inspection Service website, at http://bit.ly/grdbeef. My son started playing football this year. He says he “hits a wall” during practice and needs more protein. How much protein does he need during the football season? It’s likely your son needs to pay more attention to carbohydrates than protein. Most people need just 6 or 7 ounces of protein a day from a variety of sources, including lean meat, poultry, seafood, milk, cheese, yogurt, eggs, beans, nuts and seeds. Athletes may need a little more to build and repair muscle tissue, but not much. When athletes “hit a wall,” what’s happening is that their body has run out of carbohydrates to use for energy. The body first uses blood glucose, but there’s only a certain amount available for immediate energy needs. Then it turns to its supplies of glycogen, the form of carbohydrate stored in muscle and the liver. With less-intense physical activity, the body uses both glycogen and fat. With higher-intensity activities, including football, the body primarily uses glycogen stored in muscle. Your son may need to eat more carbohydrates throughout the day to build up glycogen supplies. When adding carbohydrates to your son’s diet, remember that half of all grains consumed should be whole grains. Whole grains include oatmeal, whole-grain bread, whole-wheat pasta, brown rice and popcorn. Potatoes, corn, lima beans and other high-starch vegetables are also good sources of carbohydrates. In addition, the Academy of Nutrition and Dietetics recommends eating a carbohydrate-rich snack or meal three to four hours before exercise, along with a small amount of protein to help build and repair muscle tissue. The food should be low in fat and fiber to make sure it digests easily and quickly. Then, 30 to 60 minutes before the activity, eating a piece of fruit, drinking a sports drink or even enjoying a few jelly beans, low-fat candy or orange juice diluted with half water will top off the body’s blood glucose and glycogen stores. Energy drinks with large amounts of caffeine or other stimulants aren’t recommended for teenagers because of the health risks they pose. Two cups of water or a sports drink two to three hours before an activity. One to 1.5 cups about 15 minutes beforehand. A half-cup to 1.5 cups every 15 minutes during the activity, without overdoing it.